As if anyone reads books any more. I'm drowning in great books to read while the Internet gives me endless distractions. My attention span is shot to hell, and my memory has been replaced by Google. I just got back to the last rock on the planet, all the way from London and the DevOps Enterprise Summit UK. It was worth all the travel. IT Revolution run a great event. There is currently a tension in the DevOps world, between influential purists saying you cannot define, codify, or certify DevOps, and most of the world saying it is bloody well going to anyway if DevOps is to be useful in the mainstream. The point of DevOps is to span silos not create new ones. I'm seeing too much of enterprises assuming one of the first steps of DevOps is a reorganisation. 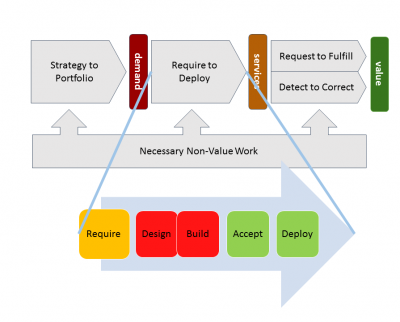 If DevOps is about collaboration across silos, how does rearranging the silos help? DevOps isn't about org structures. Over time a strange set of rites and rituals grow up around the Require-to-Deploy value stream*. Some of them are there to protect the quality of the output but others have ceased to add value. Honour existing processes, records, and controls. They arose for a reason. Streamline and simplify all processes, records, and controls. Challenge the level of ceremony. DevOps and ITIL are both ITSM. The patterns are the same though the execution is different. May 16th was a special day for me: ten years since the first post on this blog. I've had my ups and downs but I'm still going strong (though some would say I've grown too mellow). How to mark the day? Instead of some self-indulgent retrospective, I'd like to recognise the occasion by publishing a second edition of "the Worst of the IT Skeptic" book. I'd like to but I wont, because after all these years I still haven't got around to a revision of any of my books. So instead let's talk about optimism. It is hard to believe that confusion between service catalogue and request catalogue is still a thing but it is, as shown by a recent conversation on Facebook Back2ITSM.